LONDON, October 25. /TASS/. 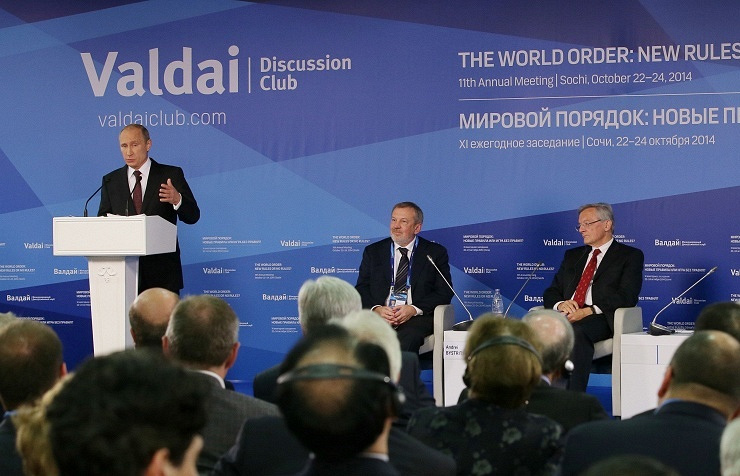 The speech of Russian President Vladimir Putin at the Valdai Club in Sochi on Friday was one of the most important foreign policy statements since he surprised the West in Munich in 2007, the Financial Times has reported. “Putin on Friday accused the US of undermining the post-Cold War world order, warning that without efforts to establish a new system of global governance the world could collapse into anarchy and chaos,” the FT reporter Neil Buckley wrote. At the Munich Conference on Security Policy in February 2007, Putin accused the United States of “overstepping its boundaries in every way” and creating new dividing lines in Europe, the report says. Putin’s address at the Valdai Discussion Club, which unites leading world political analysts and experts, is one of his anti-US speeches in 15 years as Russia’s most powerful politician, Buckley wrote. “The strength of Mr Putin’s language also took US listeners aback,” the journalist wrote. In his Valdai speech, Putin said he does not consider the United States a threat to Moscow, while saying that Washington’s erroneous policies harm mutual interests and trust. The Russian leader also said that the Western sanctions against Moscow amid the Ukrainian crisis are a mistake that affect everyone.